Andre Breton, the founder of the movement, wanted Surrealism to fight repression and liberate the unconscious through the visual and written expression of dreams and fantasies. He championed the expression of so-called ‘feminine’ qualities as a means for Man to attain a liberated androgynous, and therefore fully creative, state. However he did not suggest that Woman should conversely adopt ‘masculine’ qualities. Breton adhered to Freud’s ideas about female sexuality; the male Surrealists were particularly attracted to the concept of ‘l’amour fou’ (mad love), a state where the unconscious desires (of women) are seen manifesting themselves as physical symptoms. Although Breton exalts the ‘feminine’ he lessens its threat by positing it as ‘other’; as Whitney Chadwick points out he was ‘content to maintain the identification of the woman with this image of convulsive reality; once again, she completes the male vision by absorbing into herself those qualities that a man recognises as important but does not wish to possess himself’. 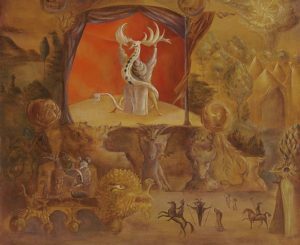 The male Surrealists represented Woman as Nature, as Child, and as Muse, borrowing images from mythology and 19th-century Romantic literature. Consequently the women Surrealists were often valued more for their possession of these qualities–and for their beauty (even Chadwick falls into this trap)–than for their qualities as artists. Thus Roland Penrose describes his ‘discovery’ Eileen Agar as having talent which is ‘the product of a highly sensitive and feminine clairvoyance’.Ithell Colquhoun commented, ‘Breton’s image of the “free and adored woman” didn’t always prove a practical help for women, especially painters’. She was also critical of the so-called ‘liberated’ images of sexuality of the male Surrealists. The four women artists in this exhibition all aligned themselves at some point with ‘official’ British Surrealism, both exhibiting and publishing with the group. Eileen Agar and Grace Pailthorpe exhibited in the International Surrealist Exhibition at the New Burlington Galleries in London, mid 1936. Later that year Zwemmers published a fourth ‘International Surrealist Bulletin’ which included reproductions of the two women’s work. Agar was one of the official signatories of the Bulletin; Sheila Legge was the only other woman to sign it. The following year, Agar was one of only two British artists to have illustrations in the catalogue to the ‘Fantastic Art, Dada, Surrealism’ exhibition at the Museum of Modern Art, New York. Ithell Colquhoun and Edith Rimmington were both introduced to the London Surrealist Group in 1939; Colquhoun participated in the ‘Living Art in England’ exhibition held that year at the London Gallery. In the accompanying catalogue published in the London Bulletin she describes herself as ‘Independent’, unlike Agar and Pailthorpe wo describe themselves as Surrealists. Colquhoun left the group the following year, together with Pailthorpe and Reuben Mednikoff, after E.L.T. Mesens attempted to force them to renounce all other allegiances and only publish and exhibit under a ‘Surrealist’ banner. automatic writing. Colquhoun experimented with Surrealist techniques of decalcomania, sfumage, frottage and collage. Agar also used collage, as well as making Surrealist objects, such as Angel of Mercy (1934) and, like Rimmington, Surrealist photographs. Pailthorpe’s use of automatic drawing was a way of realising her experiments as a psychologist. In December 1938 she published ‘The Scientific Aspect of Surrealism’ in the London Bulletin. It provoked a flood of correspondence. Pailthorpe and Mednikoffwere mainly criticised for being too ‘literal’ in their visual translation of their ideas–Pailthorpe was criticised for her lack of training and technique by a movement that frequently championed ‘naive’ art and writing. The four women adapted mythic imagery for their own purposes. Pailthorpe used the imagery of psychoanalysis; her oil The Spotted Ousel (1942) depicts the trauma of birth and motherhood. The other three plundered the imagery of classical mythology; Colquhoun effectively subverts Breton’s use of such imagery in her oil The Pine Family (1941). She repudiates his concept of the perfect androgyne with her label Thermaphrodite circoncis’ (the circumcised hermaphrodite) and subverts his use of the Freudian theme of the muse Gradiva, the ‘one who advances’ by her label ‘celle qui boite’ (the one who limps). Agar and Colquhoun both used displaced forms from nature in their work; Agar was particularly attracted to marine life, as in Marine Collage (1939), whereas Colquhoun was attracted to plant life (the subject of her unpublished novel ‘The Goose of Hermogenes’). Rimmington also looked to Nature and the Mystical in work such as The Oneiroscopist (1942). This work may contain a reference to Dali’s appearance at the first London exhibition dressed in a diving suit. Agar alludes directly to Classical Greek art in her plaster head The Angel of Mercy, the companion piece to the Tate Gallery’s Angel of Anarchy. 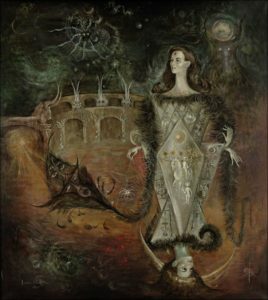 The latter refers to the Spanish Civil War, showing her affinity with the politics of Surrealism. There can be no doubt that these four artists saw themselves as Surrealists at some point in their careers. In doing so they redefined Surrealism and repudiated its male bias.